Uncontrolled diabetes can cause metabolic imbalance leading to acute complications that may require immediate medical attention. Hyperglycemia (high levels of glucose in blood) sets the stage for protein glycation, which in turn may lead to chronic conditions requiring constant monitoring and treatment. Individuals with diabetes may also develop high cholesterol and high blood pressure, which require medical management. Ketoacidosis: Despite high blood glucose levels, the body cells (muscle and lipid cells) may be starved for glucose due to absence or improper function of insulin. Cells may also starve for glucose if the amount of food intake is low (such as during illness) or if the dosage of insulin is too high. Under these conditions cells start using fats as a source of energy. Liver cells produce ketone bodies from fatty acids. When the glucose levels are low, brain cells can use ketone bodies, but not free fatty acids, for energy. High concentrations of ketones can make the urine acidic and cause fruity-smelling breath. If not managed, this condition can progress to coma (prolonged unconsciousness) and even death. Hyperosmolar Hyperglycemic Nonketotic Syndrome (HHNS): High blood glucose level triggers increased urination. If liquids are not replaced, the individual can become severely dehydrated. High blood glucose levels can lead to altered mental states, confusion, seizures, coma, and even death. Microvascular complications affect the smaller blood vessels, such as in the eyes (leading to retinopathy), kidneys (leading to nephropathy), and neurons (leading to neuropathy). Individuals with poorly managed blood glucose levels may suffer from one or more of these complications in advanced stages of the disease. Thus, besides monitoring the health of eyes and kidneys, diabetics also require foot care. Interestingly, several large population studies have shown that aggressive management of blood glucose levels (i.e., keeping blood glucose levels within a narrow range) can avoid, or at least delay, the onset of these complications (Nathan et al., 2014). Regular monitoring and management of blood glucose levels is of critical importance in maintaining metabolic balance and avoiding microvascular complications. Macrovascular complications affect larger blood vessels, such as those supplying the heart, brain, and extremities. The causes of these complications stem from narrowing of blood vessels due to glycation, inflammation, lipid deposition and other factors. Complications resulting from large vessel damage may lead to cardiomyopathy, stroke, rheumatoid arthritis, osteoporosis, and the degenerative process of aging (Singh et al., 2014). The major concern amongst these complications is myocardial infarction (heart attack). At present, it appears that blood glucose control does not significantly reduce the risks or delay the onset of macrovascular complications. Additional medical management is required. Figure 1. 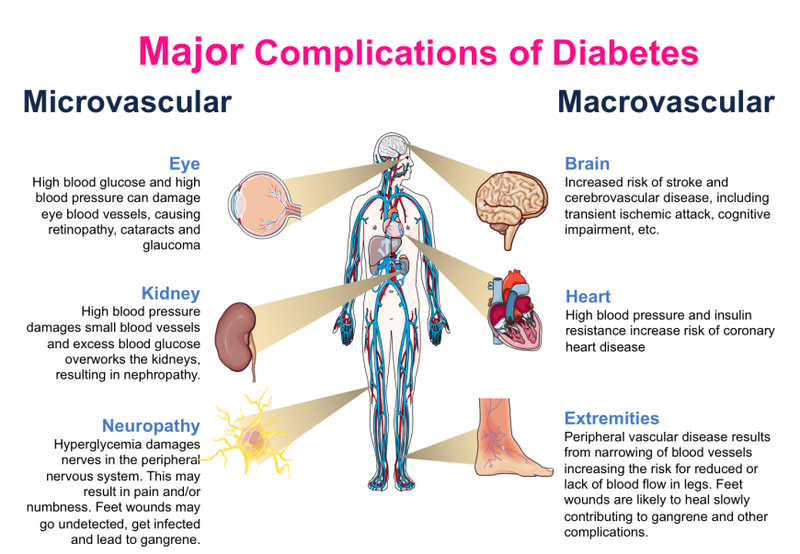 Major microvascular and macrovascular complications associated with diabetes mellitus. Parts of the image were adapted from Servier Medical Art. When proteins are exposed to high levels of sugar, for long periods of time, they may covalently attach to proteins by a non-enzymatic process, called glycation (Singh et al., 2014). Note that this process differs from the post-translational glycosylation of proteins in rough endoplasmic reticulum and Golgi, where sugars are attached to proteins systematically, by specific enzymes and carrier proteins. In early stages of glycation, sugars react with free amino groups on the protein to form a Schiff base, which further undergoes rearrangements to form a more stable product called amadori product. Over time, these glycated proteins may be further modified to form advanced glycation products (AGEs). Receptors for AGEs bind to these adducts and initiate an inflammation response, which in turn lead to some of the complications of diabetes. In poorly managed diabetes, the blood glucose levels may be high and proteins found in the blood, such as albumin, immunoglobulins, and collagen, are often glycated. A glycated product of hemoglobin (an oxygen transporting molecule present in red blood cells), called Hb A1c is used as a measure of overall glucose management in individuals with diabetes. Diabetic foot infection (DFI) is a common and complex problem in individuals with diabetes. Due to nerve damage and numbness, individuals with diabetes may not feel any pain and foot ulcers may go undetected for long periods. Infections in these ulcers may also go untreated and even when detected may heal slowly (due to peripheral artery disease). In extreme cases, the ulcers and infections may lead to gangrene and require amputation. Treating foot ulcers in diabetic patients is challenging. Often, multiple microorganisms infect the ulcers, some of which may be resistant to standard antimicrobial treatments. In order to effectively treat the infection, ideally the ulcer microbiome (genomes of all microorganisms found in the ulcer) should be studied. State of the art treatment protocols use molecular techniques such as polymerase chain reaction (PCR) and gene sequencing to identify key components of the ulcer microbiota and design specific treatments. However, such thorough analysis is currently not the standard of medical care for diabetic patients with foot ulcers.